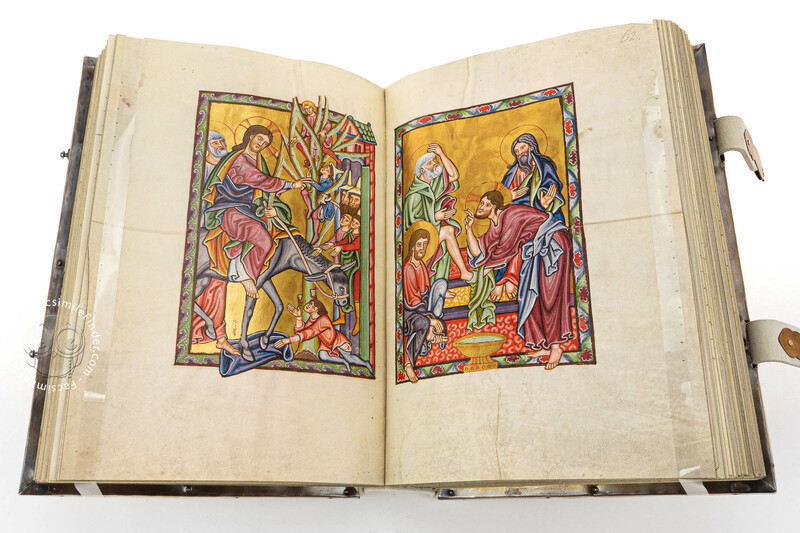 The Bamberg Psalter, dating from around 1220/30, is the perfect joint work of two artistically high-ranking master illuminators who stand in different traditions and whose juxtaposition and coexistence documents the change in style from Romanesque to Gothic. They are open to new trends, and it is delightful to discover how older styles merge with new ones in their light-flooded paintings. 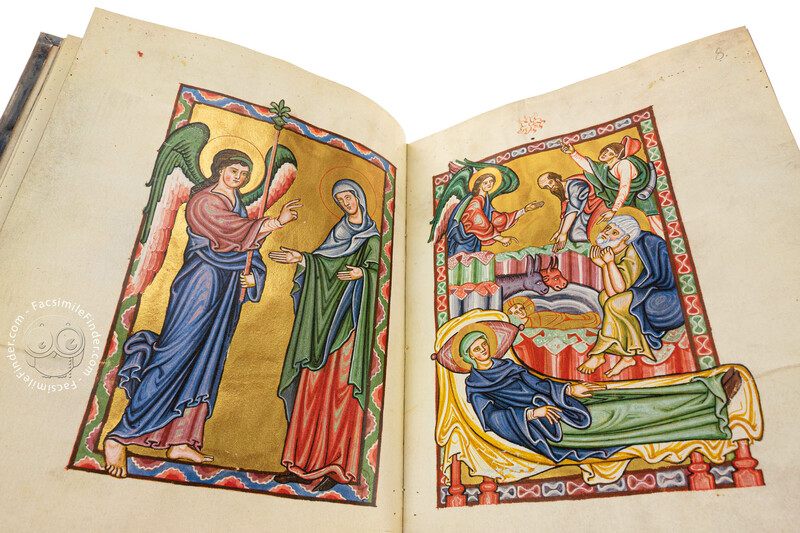 The exclusive horn plate cover along with the radiant gold content of the manuscript also form a harmonious unit: the motifs of the miniatures under the horn plates of the cover, which refer to Christ and Mary, complete the three picture cycles inside the Bamberg Psalter. 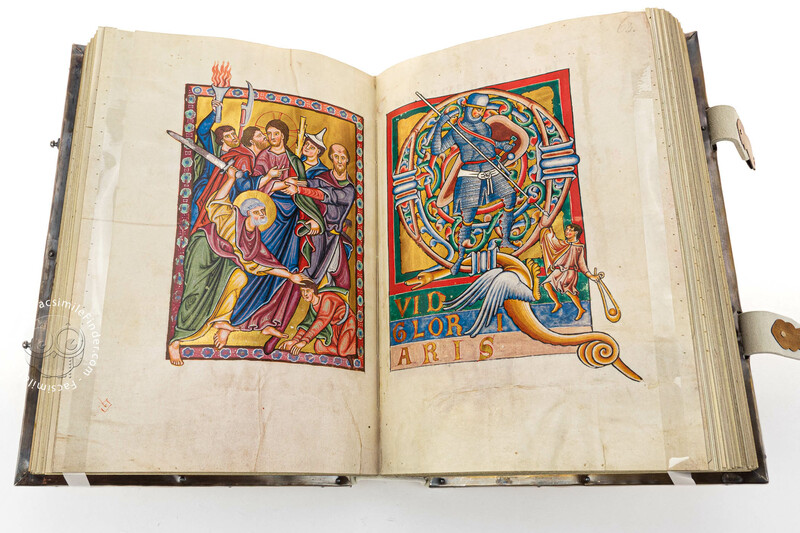 Two master illuminators created the Bamberg Psalter: a prominent chief master with stylistic roots in late Romanesque art around 1200, and a younger illuminator who is recognizably North French and influenced by the recently emerging serrated style as harbinger of the Gothic period. The miniatures of the main master are dominated by very large and well proportioned figures. Their faces have strongly rounded chins and large almond-shaped eyes. A characteristic stylistic feature is above all the design of the drape of the robes, which gives the figures plasticity. Thus, unlike his colleague, the head master wraps each of his figures in soft, fabric-rich robes with round folds. The swinging robes and the cloths laid in folds seem moved and thus reinforce the dynamics in the picture. 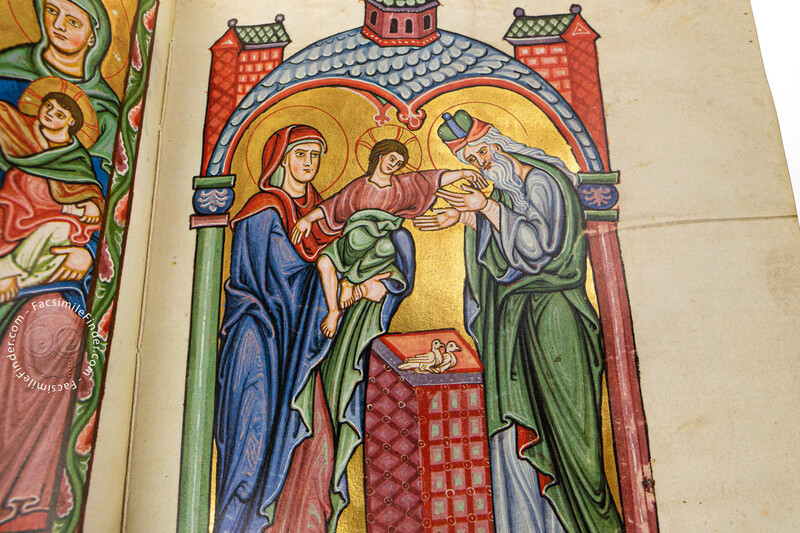 An impressive example of the painting style of the main master is the miniature on fol. 60v, which shows the wedding of Cana. In the middle of the table sits Christ, at his right Mary and on the other side the host groom. In the foreground are the six stone water jugs, which are intended for ritual purification and are now filled with water by a servant at Jesus' behest. A second servant, whose foot emerges from the lower left of the picture frame, serves the water transformed into wine in a golden cup with lid. Its two-tone garment is a detail of contemporary fashion. 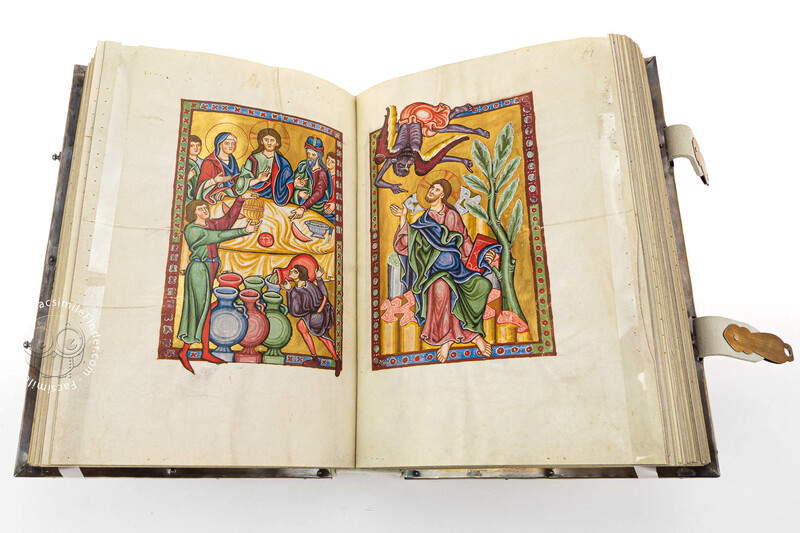 The main decoration consists of 15 full-page miniatures with scenes from the New Testament in three picture cycles of five miniatures each. 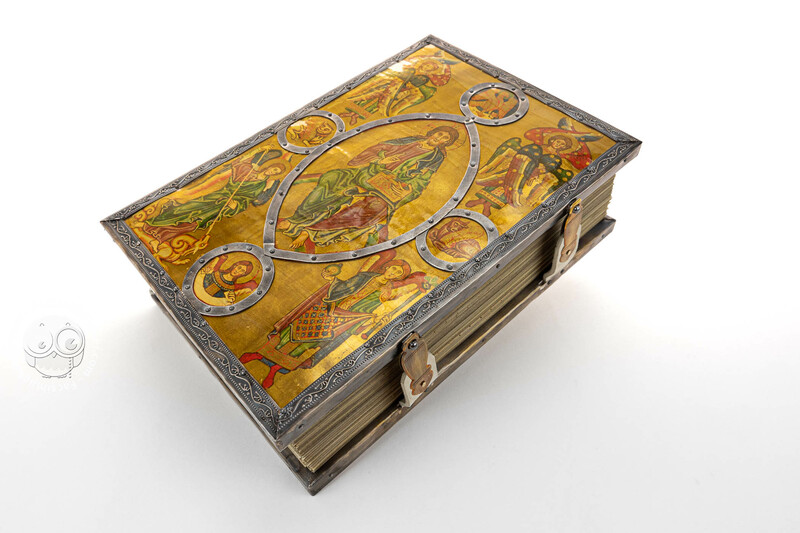 In addition, eight full-page intricate gold initials divide the Psalter into eight sections of the liturgy. 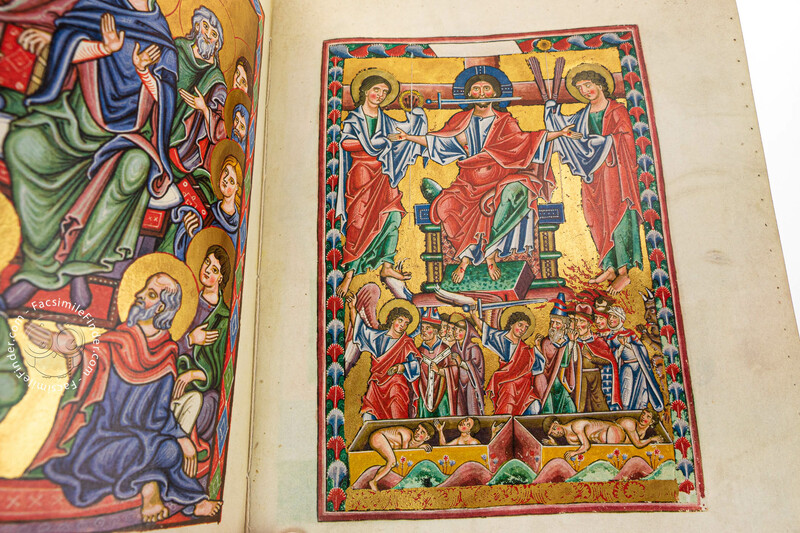 In contrast, three colorful initial pages emphasize the beginnings of Psalms 1, 51 and 100 and thus the formal tripartite division of the book which has been customary since the Fathers of the Church. All 150 psalms begin with a multi-line gold initial on a colored background, the beginnings always on a new line with an initial also executed in gold. 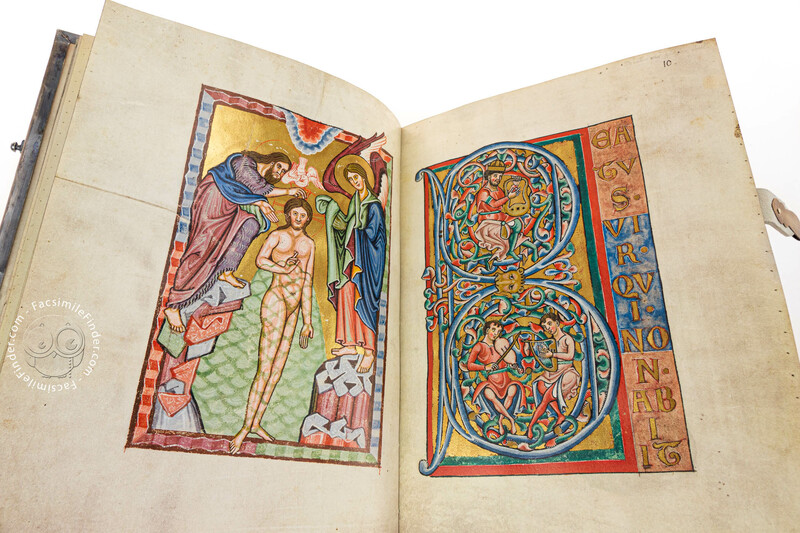 The question of who commissioned the Bamberg Psalter can no longer be answered. It is undisputed that the Psalter was intended for the private devotion of a high-ranking person. 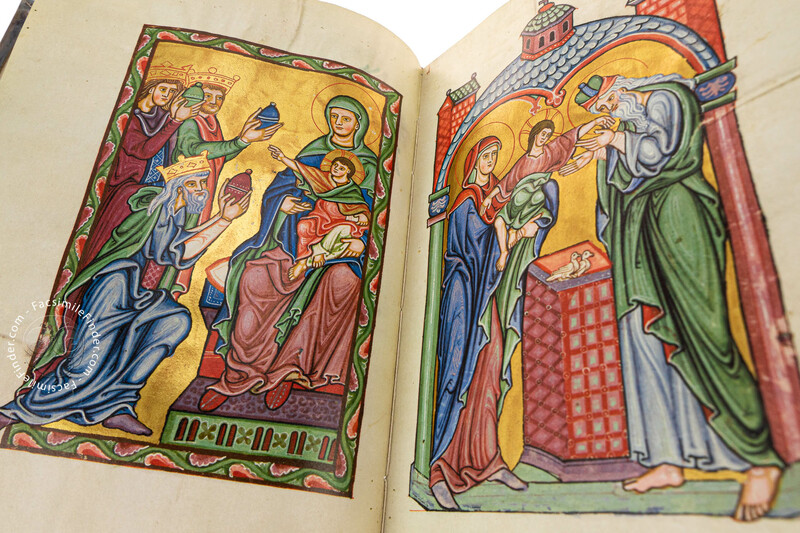 Magnificent Psalteries were often associated with noble ladies. Thus the figurative initial "I" at the beginning of Psalm 86 shows a praying woman in gold on a blue-green background (fol. 99v). This could be understood as a reference to the commissioner of the manuscript. The murder of Count Gebhard von Hirschberg († 1245) was added to the calendar (fol. 3v) on 5 June, which gave rise to speculation about the founder's family background. How she relates to the knight on fol. 135v, however, remains her secret. The coeval horn plate binding is remarkable. Opaque color paintings on parchment are visible under the transparent horn plates mounted with silver frames on the front and rear covers. Christ in the mandorla on the front cover; four medallions with the evangelist symbols bordering the mandorla in a cross; in the upper corners two cherubim, in the lower two archangels: Michael with the dragon and Gabriel with lily scepter and vessel. On the back cover Maria with the Child in the mandorla; four medallions with female figures (four cardinal virtues) bordering the mandorla; in the upper corners Aaron with flowering staff and Isaiah with rice, in the lower corners Ezekiel in front of a closed tower gate and pointing Solomon to a spring. Calendar; 150 psalms; Cantica; Pater Noster; Credo; Litany of the Saints; Office of the Pentecost. 15 full-page miniatures in 3 picture cycles of 5 miniatures each; 24 calendar medallions; 11 full-page decorated initial; 256 gold initials throughout the entire manuscript. 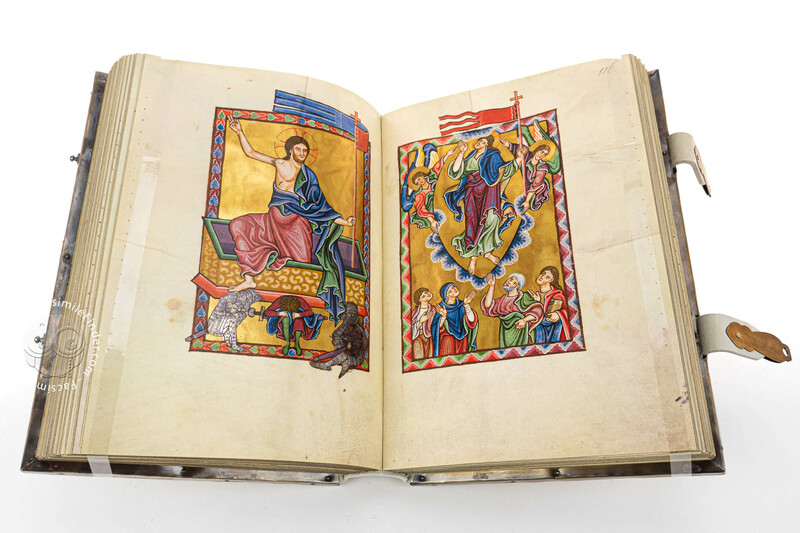 Full-size color reproduction of the entire original document, Bamberg Psalter: the facsimile attempts to replicate the look-and-feel and physical features of the original document; pages are trimmed according to the original format; the binding might not be consistent with the current document binding. 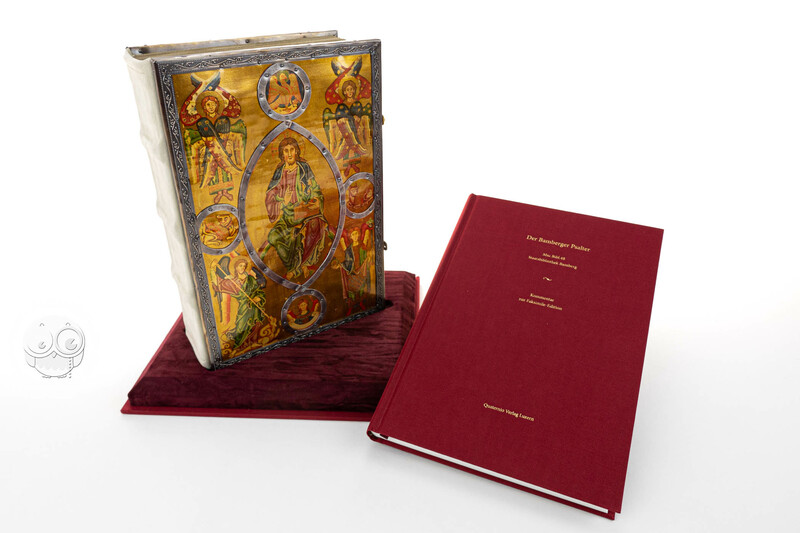 The unique horn plate binding is replicated in the facsimile edition.